A general view of Burford station - the Metro tank is drawing in with the 'B' coach set while the 48xx and auto trailer is waiting to depart from the bay. The 'spread out' appearance of a typical GWR branch terminus is well portrayed. 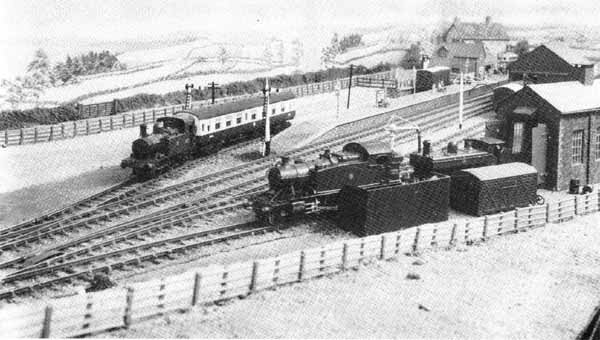 View across the goods yard - at the main platform the train for Whitney ... a 'B' coach set and Metro tank ... is ready to depart. Coal merchant's siding is in the foreground. 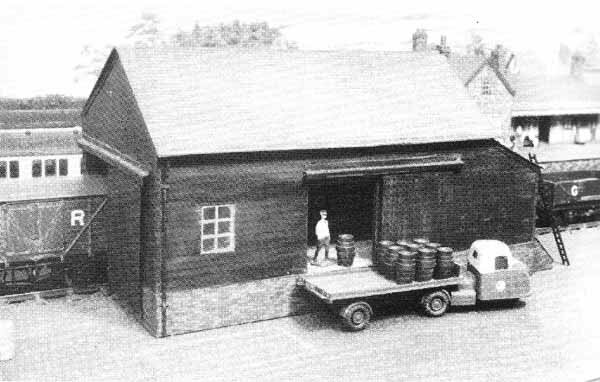 Loading bay of goods shed. Take a close look, for this 45 year old model pre-dates kits. It is made entirely of card with wood framing inside, all scrap material. Merco brick paper on the base is the only commercial item used, with Merco tile paper on the roof. The Metro tank and 'B' set approach Burford through the cutting and road overbridge. The train from Whitney is arriving as the 48XX (later 14XX) and auto-trailer waits for the connection. In the foreground is the loco shed (left) and goods consignments awaiting collection. 48XX plus auto-trailer running into the bay, with the '4575' class Prairie and Pannier tank 'on shed' in the foreground. 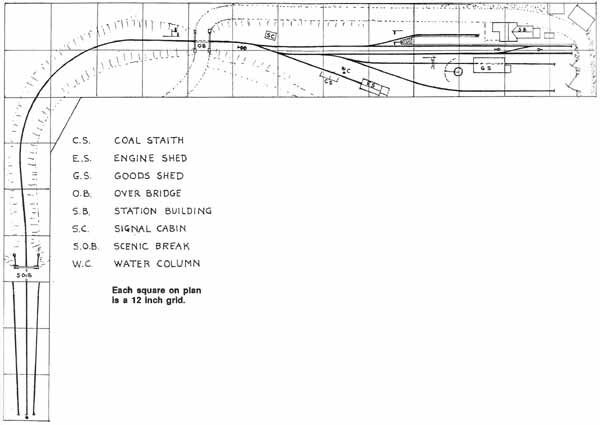 After the war all the track was scrapped and a completely new branch terminus to fiddle yard layout was started. Track was now laid on ERG fibre sleepers, nailed down with four pins per sleeper (96 sleepers per yard). This was ballasted with powdered cork, dyed grey, and nickel silver rail, which now became available, was soldered to the pins. No ready made track was available so all points had to be fabricated. The station platform and building etc. 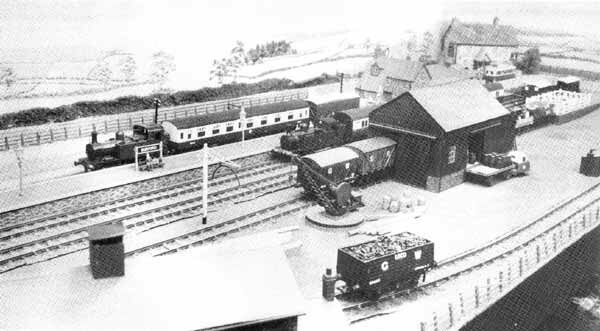 together with the goods shed and loco shed were also built. The pannier tank was rebuilt with a new chassis and a Zenith 12 volt mechanism, and two second-hand locos - a 4800 0-4-0T and a 4575 Prairie tank - were purchased together with a 'B' set that had been made by Michael Longridge. All the rolling stock had to be converted to two rail. Then came marriage, changes of residence and pressure of work and everything had to be stored. Nothing more was done until I retired 25 years ago, by which time we were living in a two bedroomed bungalow with no room for a railway, and I started to build a room in the loft. Progress was slow as I was then coping with an invalid wife who unfortunately died sixteen years ago. The layout as it now exists has been completed (?) since then, and as far as possible everything has had to conform to how the G.W.R. existed in the 1930s. Spurred on by Malcolm Carlsson, I again started scratch-building rolling stock. Locos that have been constructed, all in plasticard, consist of a Dean Goods, two 2-4-0 Metro tanks (one large and one small), a 2021 pannier tank and a 517 class 0-4-2T. 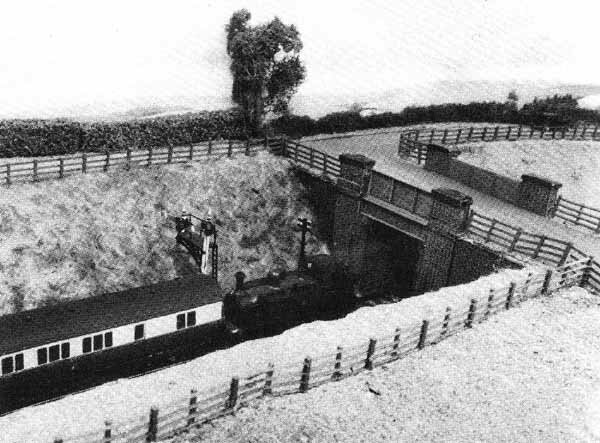 A 'B' set, a trailer car and a 1930s corridor coach have been built using the Michael method together with a Siphon C, a 6-wheel Siphon and a horse box. A large number of goods wagons and vans have been made using the invaluable plasticard. Luckily I now have all the rolling stock I require as, due to failing eyesight, modelling has now come to a halt apart from more scenic work. What I have tried to do is to create a three-dimensional picture. When an artist paints a picture he doesn't paint every leaf or blade of grass, so for me the fact that there are no rivets or brake gear on the locos and no door handles etc. on the coaches does not worry me. As I am viewing them from a scale distance of 50-60 yards they wouldn't be obvious on the real thing. 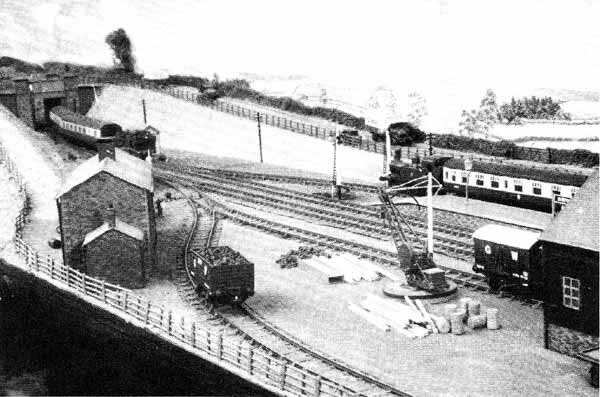 Incidentally, the layout was featured and illustrated in an article by Malcolm Carlsson in the March 1991 edition of Scale Model Trains, and a letter by Malcolm about the Burford Branch together with a photo of part of the layout appeared in Model Railway Journal No. 75 in 1994. Vernon Wood lived until 1999. Scale Model Trains was succeeded by Model Trains International.